BACKGROUND AND PURPOSE: Tumor angiogenesis is very heterogeneous and in vivo correlation of perfusion imaging parameters with angiogenic markers can help in better understanding the role of perfusion imaging as an imaging biomarker. The purpose of this study was to correlate PCT parameters such as CBV and PS with histologic and molecular angiogenic markers in gliomas. 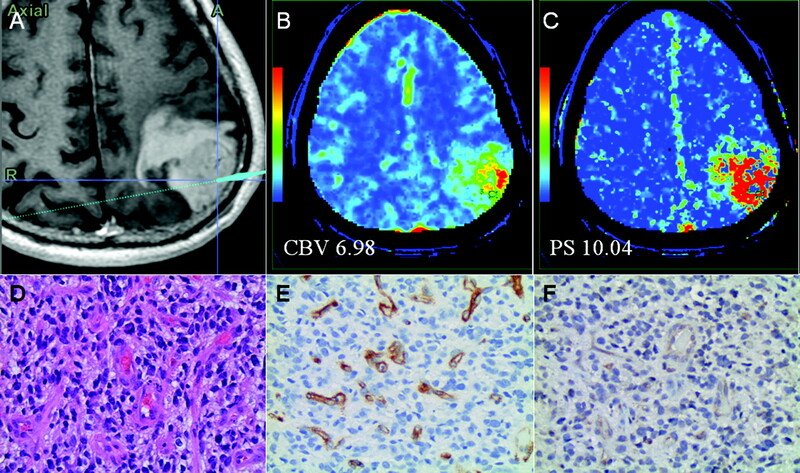 MATERIALS AND METHODS: Thirty-six image-guided biopsy specimens in 23 patients with treatment-naive gliomas underwent PCT examinations. We correlated MVD, MVCP, VEGFR-2 expression, tumor cellularity, and WHO grade of the image-guided biopsy specimens with the PCT parameters. Histologic sections were stained with hematoxylin-eosin, CD34, and VEGFR-2 and examined under a light microscope. These histologic and molecular angiogenic markers were correlated with perfusion parameters of the region of interest corresponding to the biopsy specimen. Pearson correlation coefficients and multiple regression analyses by using clustering methods were performed to assess these correlations. RESULTS: CBV showed a significant positive correlation with MVD (r = 0.596, P < .001), whereas PS showed a significant positive correlation with MVCP (r = 0.546, P = .001). Both CBV (r = 0.373, P = .031) and PS (r = 0.452, P = .039) also showed a significant correlation with WHO grade. VEGFR-2 positive specimens showed higher PS and CBV; however, neither was statistically significant at the .05 level. CONCLUSIONS: CBV showed a significant positive correlation with MVD, whereas PS showed a significant positive correlation with MVCP, suggesting that these 2 perfusion parameters represent different aspects of tumor vessels; hence, in vivo evaluation of these could be important in a better understanding of tumor angiogenesis. Tumor angiogenesis is the biologic process by which new capillaries are formed from pre-existing vessels; it is a critical process for adequate tumor tissue oxygenation and nutritional supply and also tumor invasion and metastasis.1,2 Histologic methods to evaluate angiogenesis include both quantitative and qualitative assessment of the tumor vessels, mostly based on MVD, TVA, and MVCP as well as VEGF expression. MVD has been used in quantifying tumor angiogenesis and also has been found to be an important independent prognostic indicator for survival in several human cancers.3,4 Similarly, MVCP5,6 and VEGF expression7–9 have been shown to correlate with tumor grade, aggressiveness, metastatic potential, and, hence, patient prognosis. Postsurgery histologic analysis of the resected specimen is usually limited to parts of the tumor, with the aim of obtaining a diagnosis of the highest grade of the tumor, whereas an in vivo technique assessing the tumor angiogenesis may provide similar information about the whole tumor. More important, an in vivo assessment can be repeated, and this could be particularly useful in considering the evolving nature of the tumors as well as in helping monitor treatment response. However, most of the clinically available in vivo imaging techniques are limited, due to the resolution of the techniques and the complexity of the tumor microvasculature. Brain tumor perfusion imaging by using MR imaging10–14 and PCT15,16 techniques can provide an insight into the tumor vasculature and angiogenesis. Tumor blood volume and permeability are the 2 important vascular parameters that have been shown to correlate with glioma grade, prognosis, and histologic angiogenesis markers. However, no correlation with image-guided biopsy specimens has been performed to establish a histologic basis for the individual vascular parameters by using a single perfusion experiment. Both of these vascular parameters probably represent different aspects of tumor angiogenesis, because different regions within a heterogeneous glioma may have discordant levels of blood volume and permeability. PCT can assess tumor blood volume and permeability with 1 single acquisition and, hence, could potentially help with in vivo evaluation of the heterogeneity of tumor angiogenesis. The purpose of our study was to correlate tumor blood volume and permeability obtained by using PCT of gliomas with histologic and molecular angiogenic markers. We obtained image-guided biopsy specimens and correlated CBV and PS with MVD, MVCP, VEGFR-2 expression, and WHO grade obtained from the biopsy specimen. Our hypothesis was that CBV would correlate better with MVD and indicate a more mature tumor vasculature, whereas PS would correlate better with MVCP and VEGFR-2 expression and hence indicate more immature and leaky tumor vasculature. The HIPAA-compliant study was approved by the institutional review board. A total of 43 patients with previously untreated gliomas underwent preoperative PCT for this study. However, only 23 patients (14 men and 9 women with an age range from 21 to 68 years; mean age, 44 years) who underwent preoperative PCT and image-guided biopsies (performed within 12–72 hours of PCT) were included in this prospective analysis. A total of 36 biopsy specimens obtained from 23 patients (1 specimen each from 12 patients, 2 specimens from 9 patients, and 3 specimens from 2 patients) underwent detailed histopathologic examination and were correlated with PCT perfusion parameters. Six of these 23 patients had oligodendrogliomas (grade II = 4, grade III = 2), whereas the remaining 17 were diagnosed with astrocytic gliomas (grade I = 1, grade II = 4, grade III = 2, grade IV = 10) as the final histologic WHO grade. Another 20 patients underwent PCT examination but were not included in the present analysis due to multiple factors. In 9 patients (all with high-grade gliomas), biopsy specimens could not be obtained due to marked brain shift and edema and poor coregistration after craniotomy. Four patients were excluded because of failure/poor coregistration of the image-guided surgical navigation system at the time of surgery. The remaining 7 patients were excluded because of either a very small biopsy specimen (n = 5, all cases with stereotactic biopsy procedures) or a diagnosis other than a glioma (n = 2 metastases). Perfusion studies were performed by using 64-section (VCT; GE Healthcare, Milwaukee, Wisconsin) multidetector row CT scanners in all the patients. A noncontrast CT head study was performed to localize the region of interest before obtaining a perfusion scan. For the perfusion scan, 50 mL of nonionic contrast (ioversol, Optiray, 350 mg/mL; Mallinckrodt, St. Louis, Missouri) was injected at a rate of 4 mL/s through a 20-ga intravenous line by using an automatic power injector. At 5 seconds into the injection, a cine (continuous) scan was initiated with the following technique: 80 kV(peak), 120 mA, and 1 second per rotation for a duration of 50 seconds. After the initial 50-second cine scan, 8 more axial images were acquired, 1 image every 15 seconds for an additional 2 minutes, thus giving a total acquisition time of 199 seconds.16 Eight 5-mm-thick axial sections were acquired, resulting in a total coverage area of 4 cm. PCT studies were performed with the same FOV (24 cm) and the same plane of axial imaging as the preoperative MR imaging studies to make sure that both the studies matched well. At the time of surgery, MR image−guided biopsy specimens were obtained from each patient. Before obtaining the biopsy specimen, we saved a multiplanar MR image of the origin of the biopsy by using the surgical navigation system, which was correlated with PCT maps. Each tissue sample was obtained by using small surgical forceps or stereotactic core biopsy needles and labeled. Biopsy samples were fixed in formalin after removal and were submitted for routine hematoxylin-eosin, CD34-related antigen staining in all specimens, and VEGFR-2 antibody staining in 26 specimens (17 patients). Twenty-four biopsy specimens (13 patients) were obtained by using an open surgical procedure and craniotomy performed for tumor debulking, but before starting any significant dissection or resection to obtain good correlation with the biopsy site; 12 specimens (10 patients) were obtained by using stereotactic brain biopsy procedures. The volume of the biopsy specimens ranged from 0.5–1.5 mL (stereotactic biopsy needle, 0.57 mL/core) to 1.0–1.5 mL for the ones obtained with surgical forceps (depth of the forceps cup, 7 mm; volume, 1.46 mL). The first author (R.J.) was always present at the time of registration of the surgical navigation system before starting the surgery and at the time of obtaining a biopsy, to make sure the biopsy sites were properly matched and recorded. Perfusion maps of CBV, CBF, MTT, and PS were generated at an Advantage Windows workstation by using PCT 3.0 software (GE Healthcare) and a 2-compartment model in all patients by a neuroradiologist (R.J.) with at least 9 years' experience. We used the superior sagittal sinus as the venous output function in all patients and the artery with the greatest peak and slope on time-attenuation curves as the arterial input function. A region of interest was drawn within the confines of a large vessel, and the automatic function of the software picked the pixels with the greatest peak and slope on the time-attenuation curve for analysis. Multiplanar MR images used for image-guided biopsy samples were matched with the corresponding perfusion CT maps by visual inspection in consensus by 2 authors (R.J., J.N. ), and a small single region of interest (5–20 mm2) for each biopsy site was drawn manually to match the site and size/volume of the biopsy specimen. 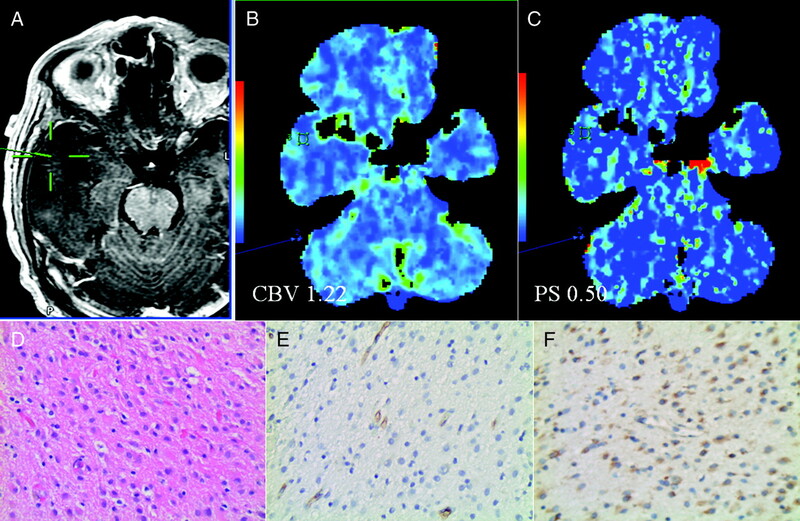 CBV, PS, CBF, and MTT values obtained from the perfusion maps were used for final analysis and correlated with the histologic assessment. All biopsy specimens were examined using a light microscope by a neuropathologist (J.G., with >20 years' experience) who was blinded to the imaging results. Formalin-fixed paraffin-embedded samples were cut and placed on charged slides. Sections for VEGFR-2/Flk-1 (Santa Cruz Biotechnology, Santa Cruz, California) were heated in a citrate buffer, pH 6.0, for antigen retrieval. Sections for CD34 (Thermo-Lab Vision, Fremont, California) needed no antigen retrieval. All other reagents were from Biocare Medical (Concord, California). Sections for VEGFR-2/Flk-1 and CD34 were incubated for 30 minutes in 1:1500 and 1:400, respectively. Visualization was with a streptavidin-biotin-horseradish peroxidase system and diaminobenzidine as a chromogen. Sections were counterstained in hematoxylin. Tissue sections were analyzed for tumor MVD, MVCP, tumor grading based on the WHO grading, and tumor cellularity as described below. Each specimen was also stained with CD34-related antigen to highlight the blood vessels for evaluating MVD. Microvessels that were included for counting were capillaries and small venules within the tumor; extratumoral leptomeningeal blood vessels were excluded. Although the tumors were heterogeneous in the MVD, areas of highest vascularization could be found by scanning the tumor sections at low magnification. For each tumor section, 2–4 areas with the highest concentration of microvessels (hot spots) were identified at ×20 magnification. MVD was determined by counting the total number of stained vessel walls. Criteria for counting a vessel were those established by Weidner.17 The areas of highest vascularization were graded on a scale of 1–3 (grade 1, <60 vessels/original magnification ×20; grade 2, 60–120 vessels/original magnification ×20; grade 3, >120 vessels/original magnification ×20). MVCP was graded into 4 categories based on the degree of hyperplasia of cells in the microvascular walls on the hematoxylin-eosin−stained slides: 0 = no microvascular cellular proliferation, 1 = mild proliferation and hyperplasia of cells in the vessel wall with <2 continuous layers of hypertrophic cells around the vessel lumen; 2 = moderate proliferation and hyperplasia of cells in the vessel wall with ≥2 continuous layers of hypertrophic cells around the vessel lumen; 3 = glomeruloid/marked proliferation, hyperplasia, and hypertrophy of cells in the vessel wall with formation of glomerulus-like structures containing ≥3 vessel lumina. For tumor cellularity, we used the following grading system: 0 = normal brain parenchyma, 1 = slight cellularity, 2 = mild cellularity, 3 = moderate cellularity, 4 = heavy cellularity. VEGFR-2/Flk-1 staining was also performed for 26 specimens (17 patients). VEGFR-2 immunoreactivity was classified as positive or negative on the basis of the staining of endothelial cells of tumor blood vessels. To assess the association between histopathology measurements of MVD, MVCP, tumor cellularity, and WHO grade and PCT parameters of CBV, CBF, MTT, and PS, we computed Pearson correlation coefficients. The P values for these correlation coefficients were computed by using clustering methods that take into account the possibility of multiple biopsies from the same patient. Clustering methods were also used to do the multiple regression analyses. In these models, the PCT parameters of CBV and PS were considered simultaneously as the predictors for the histopathology measurements, with partial correlation coefficients for CBV and PS being computed from these results. Because of the high correlation between CBV and CBF, only CBV was considered in the multiple regression analyses. The results were similar if CBF and PS were considered. To reduce variability, we used log transformations for the PCT parameters. P values < .05 were considered statistically significant, and no adjustments were made for multiple comparisons. All statistical analyses were performed by using SAS, Version 9.2 (SAS Institute, Cary, North Carolina). Of these 36 biopsy specimens, 14 were diagnosed as high-grade gliomas (WHO grade III, n = 5; grade IV, n = 9), and 21 biopsy specimens were diagnosed as low-grade (WHO grade II, n = 20; grade I, n = 1). One biopsy specimen could not be graded. Absolute values of CBV, PS, CBF, and MTT obtained from the regions corresponding to the image-guided biopsies with histologic assessment of biopsy specimens are given in the On-line Table. MVD was positively correlated with CBV (r = 0.649, P = .002), CBF (r = 0.527, P = .016), and PS (r = 0.332, P = .073), with only CBV and CBF being significant (Table 1). These results were also seen in the multiple regression analysis, with CBV being significant (r = 0.596, P < .001), but not PS (r = −0.101, P = .394). As with MVD, MVCP was positively correlated with CBV (r = 0.414, P = .095), CBF (r = 0.477, P = .051), and PS (r = 0.647, P = .001) (Table 1). However, only the correlation with PS was significant. Multiple regression analysis confirmed these findings, with PS being statistically significant (r = 0.546, P = .001), but not CBV (r = 0.037, P = .846). Our results showed a positive correlation of tumor cellularity with CBV (r = 0.482, P = .012), CBF (r = 0.498, P = .014), and PS (r = 0.409, P = .016) (Table 1). In the multiple regression analysis, only the association with CBV was significant (r = 0.323, P = .048). After adjusting for CBV, the association with PS was no longer significant (r = 0.168, P = .247). Similar individual results were noted for WHO grade (Table 1). However, in the multiple regression analysis, the associations of WHO grade with both CBV (r = 0.373, P = .031) and PS (r = 0.452, P = .039) remained significant. Low-grade (Figs 1 and 2) specimens showed lower CBV (1.15 ± 0.14 mL/100 g) and lower PS values (0.65 ± 0.13 mL/100 g/min) compared with high-grade (Figs 2 and 3) specimens (CBV, 3.53 ± 0.94 mL/100 g; PS, 3.85 ± 1.18 mL/100 g/min). A, Postcontrast T1-weighted MR image shows a biopsy site from a nonenhancing WHO grade II glioma. CBV (B) and PS maps (C) with regions of interest corresponding to the biopsy site show low CBV and PS. Hematoxylin-eosin (original magnification, ×20) (D), CD34 (E), and VEGFR-2 (F) stains show moderate cellularity (score 2), low MVD (score 1; 55 vessels/original magnification, ×20), MVCP (score 0), and negative VEGFR-2 immunoreactivity of the endothelial cells. 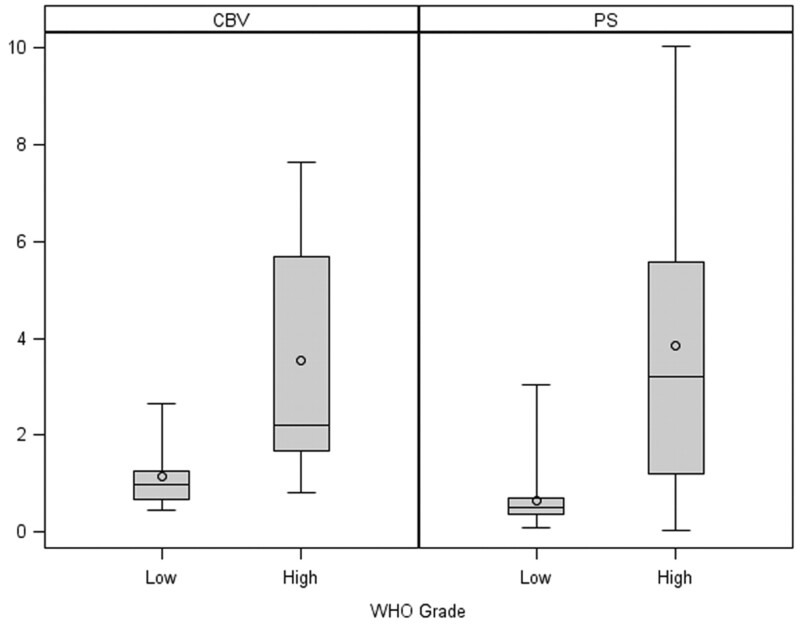 Box-and-whisker chart shows CBV and PS comparison of low- and high-grade glioma specimens. A, Postcontrast T1-weighted MR image shows a biopsy site from a WHO grade IV glioma. CBV (B) and PS (C) maps with regions of interest corresponding to the biopsy site show very high CBV and PS. Hematoxylin-eosin, original magnification ×20 (D), CD34 (E), and VEGFR-2 (F) stains show high cellularity (score 3), high MVD (score 3, 263 vessels/original magnification ×20), MVCP (score 2), and VEGFR-2 staining of the endothelial cells in the vessel lumen. VEGFR-2–positive specimens (n = 17) showed higher PS, CBV, and CBF and lower MTT compared VEGFR-2–negative specimens (n = 9) (Fig 4); however, none of these were statistically significant, though PS values showed a slight positive trend (Table 2). All 7 (100%) grade IV specimens and only 1 (33%) grade III specimen showed VEGFR-2 positivity, whereas 8 of 14 (57%) grade II specimens showed VEGFR-2 positivity. Box-and-whisker chart shows CBV and PS comparison of VEGFR-2–positive and –negative glioma specimens. Tumor angiogenesis is a complex multistep process and is characterized morphologically by an increase in the number of blood vessels, endothelial cell proliferation, and development of abnormal tumor vessels. Histologic criteria used by WHO for glioma grading include tumor cellularity, cellular pleomorphism, mitosis, necrosis, and endothelial hyperplasia.18,19 Morphologic assessment of angiogenesis does not form the basis of histologic glioma grading under the present WHO classification. However, the degree of angiogenesis is critical in assessing tumor grade, predicting tumor progression and recurrence, and hence patient prognosis.20–23 Various quantitative histologic markers such as MVD, TVA, and MVCP have been found to correlate with patient survival.8,20–23 Apart from these quantitative measures, qualitative assessment of the morphology of angiogenesis based on angiogenic patterns has also been performed to evaluate the tumor angiogenesis. The association between MVD and tumor aggressiveness can be explained by the following: 1) Solid tumors are composed of 2 interdependent components, which include the malignant cells and the stroma that they induce, and MVD could be a measure of the success of a tumor in forming this stromal component. 2) Endothelial cells in this stromal component stimulate the growth of tumor cells; thus, the more intratumoral vessels there are, the more endothelial cells and paracrine growth stimulation will occur. 3) Intratumoral MVD is a direct measure of the vascular window through which tumor cells pass to spread to distant sites.23 Tumoral MVD, however, does not distinguish new blood vessels from the native ones, does not mark actively proliferating endothelial cells, and does not correlate with the degree of endothelial cell proliferation. However, these do not seem to diminish the clinical value of this measure. Tumors larger than 1–2 mm3 cannot grow by relying on passive transport of nutrients and oxygen. Further growth is supported by angiogenesis promoted by proangiogenic factors; the most important among those is VEGF. VEGF initially leads to formation of immature and leaky blood vessels, which result in increased permeability, leading to extravasation of plasma, plasma proteins, and deposition of proangiogenic matrix proteins. Later as these pericyte-poor new vessels called “mother” vessels enlarge and give rise to “daughter” vessels through a complex series of endothelial rearrangements, MVD and TVA increase with continued increase in permeability. Finally with vessel maturation, the total number and area of blood vessels continue to increase more than the vessel leakiness. The information provided by CBV and PS is probably complementary, with CBV revealing information about the amount of total vessels in that part of the tumor, whereas PS provides information about the degree of abnormality of the blood-brain barrier, which in turn could potentially correlate with proangiogenic cytokine activity8 within the tumor. rCBV and Ktrans measurements have been correlated with glioma grade in the past by using dynamic susceptibility contrast-enhanced MR imaging. In that study, rCBV showed a stronger correlation with glioma grade than Ktrans and rCBV, and Ktrans showed a weak positive correlation, suggesting that these parameters probably represent different aspects of tumor vasculature.33 Similarly, another study showed that CBV relates to histologic grade but does not provide any independent prognostic information over and above that provided by grade, whereas the authors showed an unexpected and counterintuitive direct relationship between Ktrans and the length of survival in high-grade gliomas.34 However in this study, high-grade gliomas with higher Ktrans showed better survival, which could not be clearly explained by the authors.34 Hence, it becomes important to understand the histologic basis for tumor blood volume and permeability, to better understand their impact on patient survival. In vivo measurement of CBV has been shown to be a good surrogate marker for MVD and has shown good correlation with both grade and prognosis in various tumors.10,12,14 The present study also showed a strong correlation of MVD with CBV and not with PS. However, MVD measurements do not differentiate neovessels from native vessels; hence, CBV estimates, even though an indicator of total vascularity, may not be a true indicator of angiogenesis. CBV measurements have also been shown to correlate with VEGF expression in nonenhancing gliomas.35 However, this study never included any measures of vascular permeability; hence, we question whether CBV correlation with VEGF was confounded. In the present study, VEGFR-2 expression showed a better correlation with PS than with CBV (Table 2), even though it was not statistically significant, suggesting that a bigger sample size might enhance this difference. Similarly, measurement of tumor permeability has also shown a relationship to glioma grading13,16 as well as to tumor aggressiveness36 and patient survival.34 However, direct in vivo correlation of PS estimates with molecular angiogenic markers has not been obtained in the past in human subjects. Tumor vascular permeability has been shown to correlate with VEGF, VEGFR-2 expression, and tumor growth in a breast cancer tumor model in rats.37 In the present study, MVCP showed a statistically significant correlation with PS and not with CBV, suggesting that MVCP is associated with leakier tumor vessels and regions of increased PS within a heterogeneous tumor might indicate more immature vasculature, whereas higher CBV regions might indicate hyperperfusion and more mature vasculature. In the present study, even though correlation of PS with VEGFR-2 expression did not reach statistical significance but showed a positive trend, the correlation suggested that regions with higher VEGFR-2 expression and higher MVCP could be localized by using PS parametric maps. These regions of hyperpermeability have been shown to be associated with insufficient blood flow and oxygen transport, resulting in tumor hypoxia38; hence, identifying these in vivo could potentially help target and monitor treatment. One of the major limitations of any study involving image-guided biopsy specimens is correlation of imaging with surgical biopsy sites. We used a surgical navigation system and MR imaging for biopsy guidance and then matched the biopsy site with PCT maps as diligently as possible. To minimize this error, we excluded a significant number of patients (46.5%), mainly due to brain shift or poor coregistration/localization of the biopsy site during surgery. Placement of region of interest matching the biopsy site is also operator-dependent; thus, it is another limitation of the methodology. We also included 6 cases of oligodendrogliomas, which are known to have different biologic characteristics and higher CBV compared with astroglial tumors.39 An additional limitation due to the small sample size is the possibility of low power to detect significant associations in the multiple regression analyses. However, given the very low correlation values (<0.20) found in these models, this would be of little concern. Gliomas have complex and heterogeneous tumor vasculature; thus, different regions within a tumor may show different grades, aggressiveness, and treatment response based on heterogeneity of tumor angiogenesis. Perfusion imaging techniques including PCT can be used as a noninvasive in vivo alternative/adjunct to histologic evaluation and may be used to assess regional heterogeneity of tumor angiogenesis. Our study showed a strong correlation of tumor blood volume with MVD and of tumor vascular permeability with MVCP, suggesting that these vascular parameters may represent different aspects of tumor angiogenesis. Tumor blood volume could be a better predictor of mature tumor vessels, whereas tumor permeability could be a better predictor of immature or leaky blood vessels and a more aggressive angiogenic phenotype that has a higher VEGF expression, as shown by correlation of VEGFR-2 immunoreactivity with PS estimates (P = .071) in the present study, which does not quite meet the statistical significance of .05. This in vivo correlation of various histologic angiogenesis markers with PCT parameters could be implemented in any perfusion imaging technique, including MR perfusion techniques, which can provide information about tumor blood volume and permeability. A better understanding of the immune-histologic basis for these imaging perfusion parameters will help improve their utility as quantitative imaging biomarkers, which is of utmost clinical importance, considering the increasing use of imaging in oncology and also increasing use of cytotoxic and antiangiogenic agents. Identifying tumors or regions within tumor with more aggressive angiogenic phenotypes either before treatment or during treatment could help alter the treatment for a better response. In the future, some of this information could also be translated into providing “compartmentalized therapy” (ie, treating different regions within a tumor with targeted combinations and dosages of therapy rather than treating the tumor as a whole). This project was supported by first author's (R.J.) GE-AUR Radiology Research Academic Fellowship grant. Accepted after revision June 27, 2010.